Time can be an overlooked element in business. Time can be an enemy, and time can be a friend. Understanding the impact of time on your business separates the best business minds from the rest. Time affects the pace of change for components of your business, your industry; and time affects our neighborhoods and cities, our economy, our government, and our environment. These ideas struck me as I read Steward Brand’s book, Clock of the Long Now, and watched his recent presentation at an Evernote conference. Brand uses this graphic to explain his idea that resilient systems (and resilient companies) have components with different paces of change. The interaction among these components provides stability and the ability to incorporate shocks. 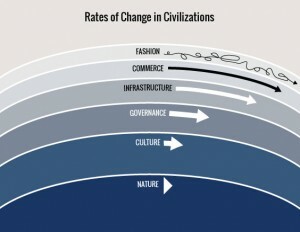 His components from fast change to slow change are: fashion, commerce, infrastructure, governance, culture, nature. In business, it often takes a while to get alignment and coordination among the different layers in the stack of activities — such as the business model, customers, investors, employees, systems and processes. The pace of change on some of these can be quick, and some will be slow. Having the ability to absorb and incorporate shocks and new innovations while maintaining continuity with your most important values and competitive advantages helps make resilient companies. Time (and its relation to the pace of change) is the friend of a great business, and the enemy of a poor business. 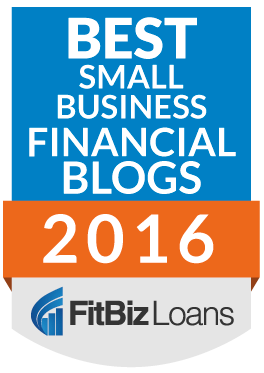 Time ticking past while a great business compounds in value is a wonderful thing. Time ticking past as a company burns cash or a deadline looms is stressful. It is worth thinking about how to construct your business so that time (and the pace of change in your business or industry) is your friend. I liked this quote, so I wanted to include it. Brand includes this quote by mathematician and scientist, Freeman Dyson, with a similar idea on how different rates of change impact humanity.